Yankees Brian McCann (34) and Antoan Richardson, right, celebrate with Chris Young after Young hit a walk-off, three-run, home run in the Yankees 5-4 victory over the Tampa Bay Rays on Thursday, Sept. 11. The Boston Red Sox have signed free agent outfielder Chris Young to a multi-year deal, according to Comcast Sports Net New England. The terms of the deal were not immediately released. 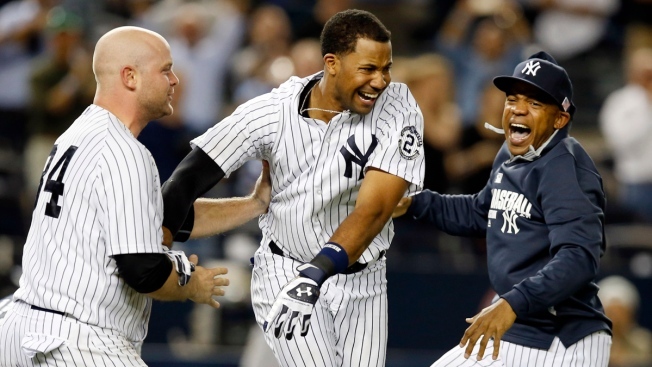 Young played for the New York Yankees last season, batting .252 with 14 home runs and 42 RBIs in 356 plate appearances. He is expected be used as a platoon player with the Red Sox. The Sox are also said to be a possible landing spot for some big name free agent starting pitchers, including the Toronto Blue Jays' David Price.